Fascinating ankle strap sandal featuring a metallic synthetic upper with a rhinestone covered t-strap and a classy moderately high 2 3/4 in heel. Accentuate your evening look with these marvelous Anneka sandals by Touch Ups. 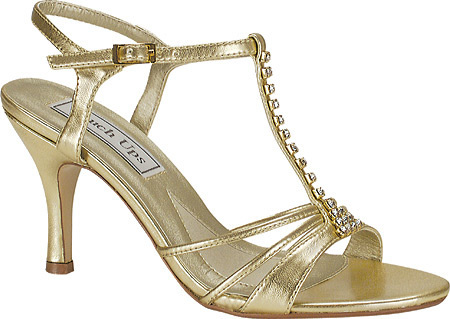 Metallic faux leather upper in an evening dress sandal style with a round open toe. Dual delicate straps create pretty detail at the vamp, with a wide metallic T-strap overlay showcasing a fabulous rhinestone embellishment. A slingback heel strap with an adjustable side buckle offers precise fit. Faux leather lining and cushioning logo footbed, smooth outsole. 2 3/4 inch metallic wrapped heel.